Yesterday I received an email from Unite the Union. 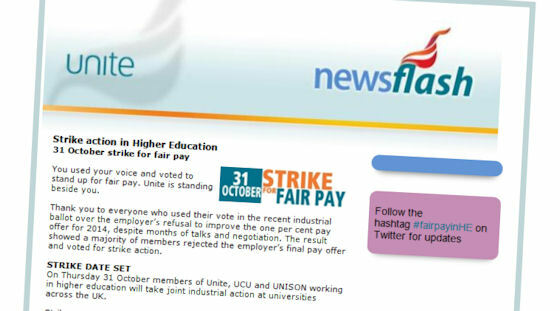 of which I am a member, calling me out to strike in favour of fair pay on Thursday 31 October. I joined Amicus (MSF Clergy and Churchworkers branch) in 2003 which later merged with the TGWU and became Unite the Union. My reason for joining a union began with a letter I received on 11 January 2003 which gave me six weeks to leave my then position as assistant curate, a post that according to canon law requires me to be given three months’ notice. I felt wonderfully supported by the union and their advice was really helpful even if I was made to be felt like a trouble-maker by getting involved with the unions. 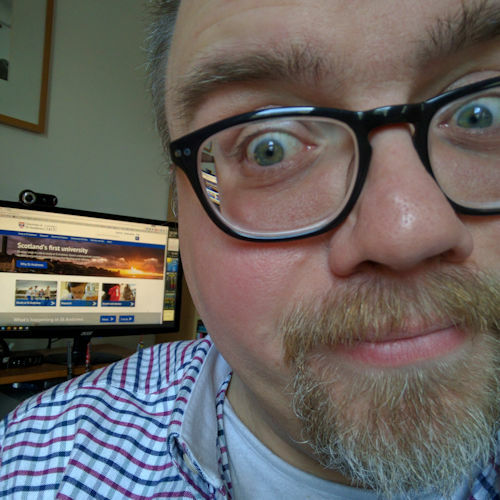 When I moved from full-time church employment to the university in 2006 I kept my union membership up and simply moved branches from churchworkers to higher education. A few years ago while the University of St Andrews was merging two units (Business Improvements and IT Services) the three main unions that support those working in higher education: UCU, Unison and Unite were a very present help to those of us caught up in the uncertainty of the restructure. Over the last few years I’ve received ballot papers from Unite asking it we wanted to accept these low pay offers, and if all unions rejected the offer would we be prepared to take matters further with work-to-rule directives or strike action. Each year the vote has returned a ‘no’ to strike action from my union. Until now. On Thursday 31 October (a week today) the members of Unite, UCU and Unison have been recommended to take strike action at universities across the UK. Given that strike action is such a serious sanction the unions recommend that all members observe the strike. Not doing so rather undermines the bargaining power that the unions have and makes it harder to protect its members. The union has supported me tremendously over the last ten years, time for me to support them supporting me. So, it looks like I’m going on strike next week. Over the last month I’ve slowly begun exploring Node.js and so far I’m really liking what I’m seeing. This means that you can now write applications, or ‘modules’ that can do stuff outside the scope of a web browser. For example, you could write a simple web server in Node or — and this is what I want to use it for — you could write modules to manipulate web code and automate certain processes related to web development. Click the “install” button to download the installer. Run the installer (make sure you tell the installer to add references to your PATH system variables). Almost everything you do with Node is via a command line. You can use either the standard Windows cmd.exe or Windows PowerShell (or, indeed, any other command line interpreter (CLI) you may have installed). 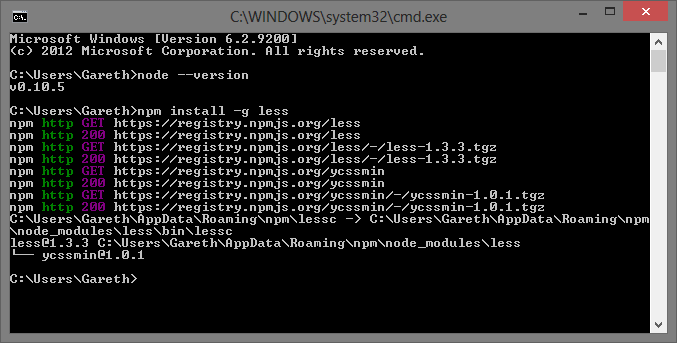 One of the great things about the Node installer is that it automatically installs the Node Package Manager. This makes it much easier to install additional applications to extend Node’s capabilities. The first application/module that I want to investigate in depth is the CSS pre-processor Less which is used by the Bootstrap project. I will no doubt report back.